Check out the saddles on this page to get ideas for your next custom saddle. Full floral carved saddle with dyed background. It has Texas Dally horn and in-skirt front rig with a rear cinch ring. Basket corner stamp saddle with Carlito Border. It has a Texas dally horn with a plate in-skirt rig and rear cinch ring. Rough out saddle with Carlito border. This saddle has a Texas dally horn, a plate in-skirt front rig and a rear cinch ring. Rough out with Carlito border. 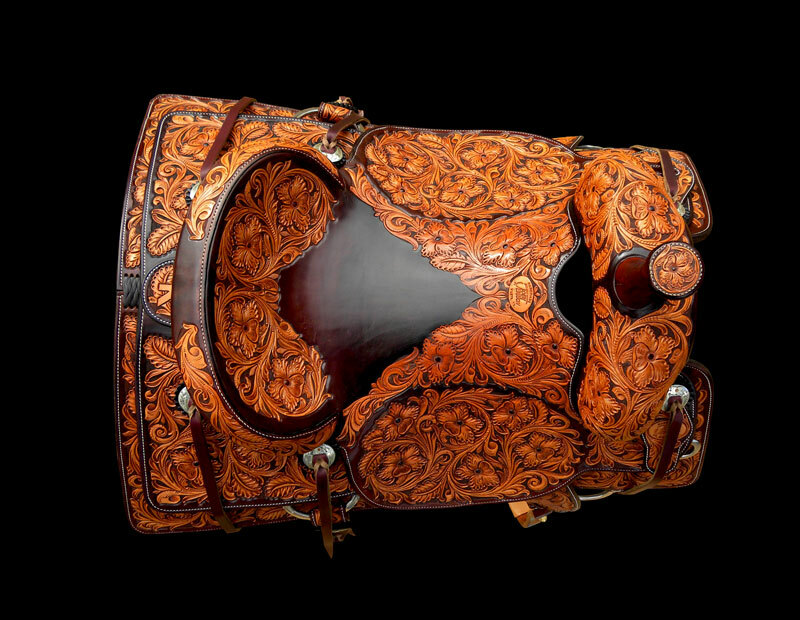 This saddle has a Pistol grip horn and a plate in-skirt rig with a rear D cinch ring. Basket stamped corners with Carlito border. Straight cantle with a Texas dally horn and a plate in-skirt front rig and rear cinch ring. Partial tooled Tame Rose with dyed background and borders. Inlayed padded seat with wood post horn wrapped in latino. Plate rig in front and a cinch ring in back. Straigh cantle and a Texas dally horn with a mule hide wrap. Will James tree with round shirts. 7/8 Double weave stamp with rough out and padded seat. Full double rig. Corner stamp double weave. It has a Texas dally horn with a plate in-skirt front rig and a D-Ring in the rear. Double weave stamp with a pistol grip horn and straight cantle. It has a plate in-skirt front rig and a D-RIng in the rear. Pistol grip horn with a straight cantle and plate rig in-skirt front rig and a D-Ring in the rear.